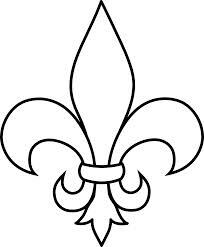 Many years ago, I lived in the Crescent City. This was in a time of relative innocence before Katrina, before the Saints were consistently good, before Casino gambling was legal, but ….it was not a time before there was good food. I think there has ALWAYS been good food in New Orleans. It was probably written into the Louisiana Purchase agreement. You can’t swing a stick in that city without hitting a restaurant or sandwich shop or street vendor selling some delicacy…that is good to eat. and the muffuletta is a big-@$$ sandwich. 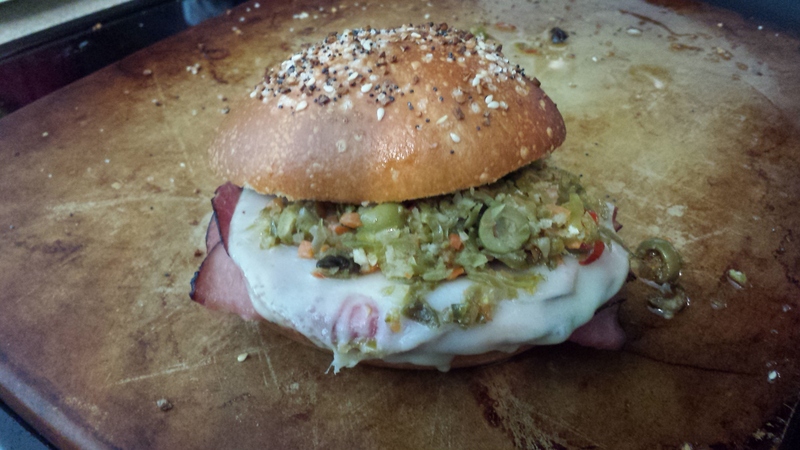 The muffuletta (moo-foo-let-ah) is a creation of the Italian community of New Orleans. The story goes that ca. 1906, Sicilian farmers selling produce at the Farmer’s Market would stop into the nearby Central Grocery for lunch. They would order ham, salami, cheese, olive salad, and bread, and then sit out on barrels or crates with everything spread out, eating everything separately (as is typical in Sicilian culture). The proprietor of Central Grocery (Signor Lupos Salvatore) suggested that they cut open the bread and prepare everything as a sandwich, and a new sandwich was born. The muffuletta is ubiquitous in New Orleans now, but there is a sign outside Central Grocery claiming the birthright. The name was derived from the bread roll used, which was determined to be better than french bread (already in high use for po-boy sandwiches) due to its soft interior and crunchy exterior. The typical muffuletta roll is a flat-ish bread disk that is about 10 inches in diameter. So it’s a huge sandwich. That is why it is typical for sandwich shops to sell 1/4 or 1/2 muffulettas. Too much food you say? There is a way to bring a little of that Noo Awlins food to your kitchen. Cut the bread roll horizontally, and dress the bottom slice with the olive salad. Add the sliced ham, cheese and salami in alternating layers to the bottom bread roll and top with more cheese. Top the sandwich with more olive salad and the top piece of bread roll. You can prepare several sandwiches this way for a family, party or to save for later. You may eat your muffuletta cold (as is traditional), or it can be toasted for 15 minutes or so (as shown below). Serve with some good ridged/ruffled potato chips. *Disclaimer: This sandwich does not adhere to the strict ingredients of the muffuletta, but it is quite tasty and suitable for consumption. **There are store brand giardiniera salad mixes that are quite good, or you can be adventurous and try to make your own. Someday, when I’m feeling more adventurous…. This entry was posted in Blogroll, Cooking, knowledge, nostalgia, prose, southern, Uncategorized, writing and tagged food, muffuletta, New Orleans, Not Poetry, prose, Sandwiches, Southern, writing on October 9, 2014 by John S.